Each class runs three hours: from 9-12 or 1-4, on its scheduled days. Instruction takes places at NBYC. An introduction or reintroduction to sailing. This class is for the young student who has one year or no prior sailing experience. Beginner students will have fun and learn skills in both small group and whole class lessons. The basics of sailing, wind directions, parts of the boat, rigging, steering , sail trim, tacking, jibing, knots, towing, and docking, capsize and recovery, bailing as well as basic boat care. Swimming, games, and knot tying will all be part of this fun-focused introduction to sailing class. This class will be taught primarily in Optis and Blue Jays. There are two sessions available, afternoon and morning. This class is designed for the young sailor who has mastered the beginner class and is ready to learn some basic racing skills. These skills can be tested at local Eastern Connecticut Green Fleet Regattas. These fun, low-key regattas are for kids that want to begin and test competitive racing. Owning your own boat is a good idea and encouraged. This class is for the older beginner sailor. This fun class will be taught in 420s, Blue Jays, and our new RS Fevas. A combination of fun activities and skill-building drills will be incorporated into the class to develop a love of sailing and confidence in each child. Sail trim (main, jib, and spinnaker), weight distribution, upwind steering, points of sail, sailing backwards, introduction to spinnakers, tacking, jibing, knots, towing, and docking, capsize and recovery, bailing as well as basic boat care will all be covered in class. Seamanship and basic racing will also be introduced. This class is for the Opti Sailor who is eager and committed to learning racing skills. This class is longer in length to provide sailors more time in the boat, a concept proven to develop stronger skills. Opti racers will develop racing skills including rigging for optimum speed, race preparation and strategy development, various starting tactics, upwind/downwind steering, strategy, and rules. Classes will be formatted to include both small group instruction focused on boat handling (mark rounding, roll tacking/gybing, starting, etc.) and whole class racing. Opti Racers will be encouraged to participate in Twilights, weekend racing, and regattas (for which coaching will be provided). This class is for the 420 Sailor who is eager and committed to learning racing skills. This class is longer in length to provide sailors more time in the boat, a concept proven to develop stronger skills. 420 racers will develop racing skills including rigging for optimum speed, race preparation and strategy development, various starting tactics, upwind/downwind steering, double handed sail trim, and rules. 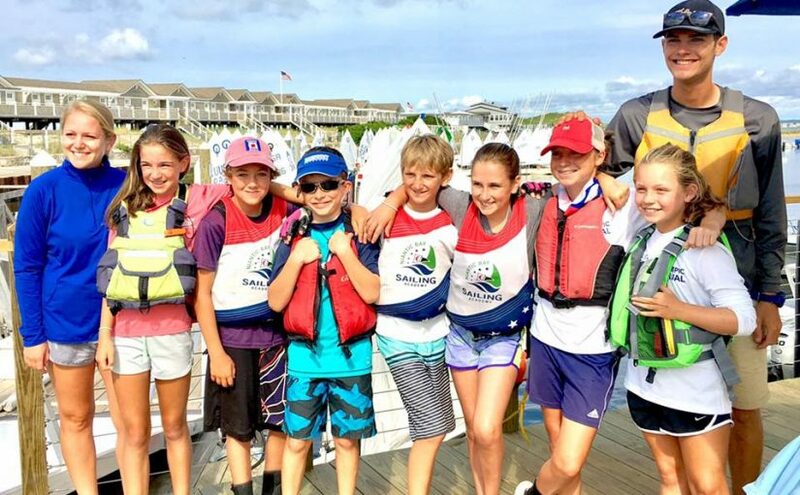 Classes will be formatted to include both small group instruction focused on boathandling (mark rounding, roll tacking/gybing, starting, spinnaker and trapeze, etc.) and whole class racing. 420 racers will be expected to represent NBSA in the ECSA team races and are encouraged to participate in Twilights, Weekend Races, and regattas (for which coaching will be provided).